This section aims at addressing the most common and recurring questions about a federal Europe and a European Constitution. Among others, it deals with why we need these reforms, their consequences for countries and people, and details about the Constitution itself. Why do we need to reform the EU? Opinions greatly vary about the EU. Even though popular opinions are consistently more pro-European than political parties, recent years have been marked by a downturn in positive opinions: failure to efficiently solve crisis after crisis has made people increasingly unhappy about the European Union and its institutions, especially in relation to what it was supposed to accomplish. Often seeing their own situation deteriorate, people can no longer turn a blind eye to the fact that “shared prosperity” has not materialized for all. This change in opinions has already had dire consequences – with a sharp return of nationalist and populist groups, most notably on the far right – and has led to the United Kingdom’s decision to leave the Union. Faced with this situation, we acknowledge the fact that the EU’s way of working, its bodies and their prerogatives are not satisfactory. Back when the economy was growing in a more or less pleasing manner, it was easy to downplay governance issues, since most people were benefiting from the system, albeit at varying levels. Following the 2007 crisis, with slugging growth and increasing inequalities, we are hit hard with the fact that the system works for some and leaves many behind. This cannot be considered a working system, and a broken system must be changed. Therefore, while the principles we promote were just as valid yesterday as they are today, the urgency of the situation has made a drastic change necessary and necessary now. Can’t we just leave the EU and get back to the good ol’ days? The “good ol’ days”, as we often picture them, are either gone – and there is no way to turn back time – or were completely imaginary to begin with. Technological advances, that have created challenges along with their opportunities, cannot be uninvented. And times when everything went well are the product of our imagination: every period had its own challenges, but it’s easy to downplay them now. This, however, is no cause for sadness. There is no reason not to be optimistic about the future: we will make change happen and we will see better days. Technology has made the world more interconnected than it’s ever been. And this is a profoundly good thing, and one that has characterized mankind for all of its history. It’s simply happening faster now. Of course, there are downsides to this and a consequence has been increased competition for jobs and resources, precisely when automation is continuously reducing the manpower required for the production of goods and services. Leaving the EU, reintroducing barriers for people and trade are a futile and dangerous step backward. Futile because closing yourself to others will not turn back the tide of social and technological change. Dangerous because, by closing yourself up, you are considering everyone else as, at best, a competitor or, at worse, an enemy. This runs directly against our values of solidarity, of celebrating diversity, and solving problems together. Unlike what nationalists would have you believe, life is not a zero-sum game and we can create more and create better when we join forces. This is why we come together as societies. Finally, in a global system that favours the economically strong, European countries – all relatively small in population and territory, and with limited resources – are doomed to face increased competition from larger players and developing countries catching up with their potential. Instead of isolating ourselves and fighting among us, as we have done in the past, we would be better off staying united and designing new ways to work collectively and become a strong force for peace and justice on the world stage. What kind of reforms do we need? Even though not officially called as such, the current European Union is a confederation. An advanced form of confederation, yes, but still a confederation. Simply defined, a confederation is “union of sovereign states, united for common action”. Since the members of a confederation retain their sovereignty, confederal institutions remain weak and confederal actions slow and inefficient. Historically, confederations have always failed, either turning into federal models or disappearing entirely. There is no reason to think the same will not happen to the European Union, and the current efficiency of our institutions as well as rise in anti-EU movements are not reassuring. As such, the EU, despite long-term growth for decades, has proved unable to successfully and efficiently deal with the economic crisis. Where most States in the world have reconnected with growth, we have moved from one crisis to the next, including the Greek crisis and related Euro crisis, the Brexit crisis, and now the continued threat of growing populism. All the while without satisfying economic or social progress. Instead of using these challenging to develop new solutions and greater solidarity, we have turned back to old recipes, bringing back borders and leaving States in need to fend for themselves. Broadly speaking, there are three courses of action: the status quo, the dissolution of the EU, and moving forward with integration. The status quo has proved unable to deal with current challenges. Giving up and splitting the Union back into separate national entities is not a viable option, as it would leave us even more exposed to global competition and accelerate the race to the bottom that has afflicted citizens and workers across the Union. Our only solution is therefore to move forward, to move to a real federal model where people have full control of their institutions and where common institutions have the power to act for the benefit of all. 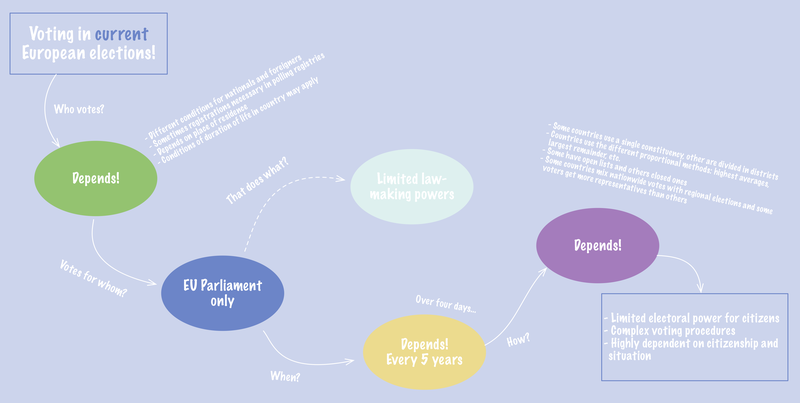 Such a model includes a strong bicameral legislature: our current EU Parliament would become a full-fledged lower house, representing the people with the power of legal initiative (meaning to prepare, discuss and adopt laws), and the Council would make way for a Senate where States would retain equal voting rights to balance the proportional representation of the Parliament. The EU Commission would be replaced by a cabinet of federal ministers, headed by a federal Prime Minister who would stem from Parliament and therefore be indirectly elected by the people. Above this government, a directly-elected President would ensure the stability of the system, detached from party politics. A strong judiciary would complement the whole and ensure the respect of federal law. This system draws from the American, German and Austrian models of federalism, one having proved its endurance and resilience, the others introducing welcome parliamentarianism. A federal model will not only bring stability and efficiency to EU institutions but also bridge the current democratic gap by linking people directly with their institutions and representatives. In simple terms, a constitution is the basic law of a country: it says who we are and creates the institutions we give to ourselves for the management of our public lives. All countries, in one way or another, have one. As such, a constitution is both a legal and political document. A constitution must be clear and concise, so that it may be understood by all. A constitution must be limited in scope and flexible, so that we may adapt to changing times. It is important to understand that a Constitution is not supposed to include all laws or provide for all situations. In the political house we inhabit, the constitution is the foundations, the walls, the roof. It provides a frame, but it does not fix the way the house will look like. Likewise, the constitution gives us the structure and the tools for our political system, but it does not forever decide of our laws. We first give ourselves a constitution to create institutions and then give ourselves the laws we think best. These laws will change with time, with social and technological changes, and as our opinions evolve. Why should the EU have a constitution? If we choose to move to a federal system, as we should, we must establish a robust and flexible basis for our institutions. One that creates stable and democratic institutions and provides for a new legal system. We therefore need a constitution. This constitution will need to be clear, concise and limited in scope. And there lies one of the reasons the 2005 “Treaty for a European Constitution” was destined to fail. With its forty-four titles and sections and its four hundred and forty-eight articles, not only did it give everyone something to disagree with, but it tried too hard to set in stone the needless complexity of the current treaties, which, as we go along, have become more bloated and obscure. As the EU today, it was unreadable. In any case, this proposal failed to provide true federal institutions and therefore cannot be the solution to today’s problems. This is why we are proposing this European Constitution, so that it may serve as an example, so that we may see that this is not just fancy talk without content. We can devise clear and functioning institutions, simple enough to be explained to children, and robust enough so that they may stand the test of time. We can – and should – debate the merits of this text and amend it, but we cannot pretend it’s not there and that an EU constitution isn’t possible. When would these reforms take place? Drastic changes to institutions are not easily brought. People are often attached to their situation and tend to be risk- and change-averse. In this case, the change induced in all European countries by a constitution and federalism will indeed be substantial. As a first step, the EU could implement so-called “same-treaty reform”, which can improve governance without the need for a new treaty. But make no mistake about this: we will need a qualitative change. Sooner or later, we will need to change the system itself. Therefore, the calendar of these reforms is actually less reliant on the content and scope of the reforms than on our willingness to adopt them. If a strong majority of the Union’s population was today in favour of new institutions, the change could be completed in a relatively short time. As required by a democratic approach, these institutional changes should not be imposed against the will of the people. On the contrary, we need to discuss the current situation, the way to improve it, and convince people of the necessity of change and of the validity of federalism and of this constitution. This will take time and effort but remember that nothing less than our future is at stake. Wait, so my country is no longer going to be a country?! If by “country” you mean “sovereign political entity”, that is correct. Let’s not shy away from the truth: once the EU becomes a federation, EU countries – by definition – will no longer be sovereign entities. There is no reason to try and hide this; it is important and a change for the better. We argue, however, that our countries already no longer are sovereign entities. A growing corpus of EU law, strengthened standards of international law, and increasing powerful multinational companies have all contributed to slowly eroding the power of national institutions. So, regardless of federalism, our nation-States are already not the independent entities we believe they are. And, at least in the first two cases, for good reasons: both EU law and international law have contributed to harmonising practices and norms – from humanitarian principles to health and trade regulations. Furthermore, this is no “loss of sovereignty” but instead a “transfer of sovereignty”. While this may seem like a frail nuance, it is actually a major element. Sovereignty is the ability of a people to decide for itself. By coming together at the EU level, Europeans are not losing any of their sovereignty, they are simply choosing to place part of their decision-making at a higher level. So not only is that decision-making power not lost, but it will actually be reinforced compared to current EU institutions, since people will directly elect their representatives and have transparent, responsive and accountable institutions. Speaking as one, the EU will also have a stronger voice on the global stage, meaning once again regaining part of our sovereignty. Think of your current nation-State: you have local elected officials that you share with your neighbours, regional elected officials that you share with people in nearby cities, and finally national elected officials that you share with the nation as a whole. All these officials represent you and work for you at different levels, only on different tasks. Creating a federal EU will not take power from you, it will simply allow you to choose your representatives for EU-level matters. Overall, it’s nothing really new: it’s the same system that you already have at the national level but extended to the EU level for all matters that concern the EU as a whole – just like some matters concern your country as a whole, and not just your local community. And, of course, you can still chant your national anthem and wave your flag, we’re all happy about that. Why do you want Brussels to govern everything? We certainly do not want Brussels to govern everything. Federalism is a very flexible system: you may decide to have a strong and powerful central system, or you may decide to have a small and loose central system. The one element that matters for federalism is the actual ability to decide, instead of being stuck with unanimity. A core principle is that of subsidiarity. Subsidiarity means that each level of government focuses on its own attributions. Let’s take an example. In a given country, a municipality may decide on the development of local infrastructure and a region on the management of schools or hospitals in its territory, while the national government sets norms and regulations that ensure a certain degree of harmonisation across the country. For instance, the building and maintenance of roads will be decided at the local level but the speed limit will be the same at the country level. So it goes with the European level. Matters that concern the local, regional and State levels will remain decided at these levels. EU institutions will focus, as they try ineffectively to do today, on harmonising wherever necessary, and on deciding Europe-wide matters. It would, for instance, ensure that criminals cannot go hide in other countries, properly fight against tax evasion, and make sure that we all enjoy social protection. Even more importantly: European institutions will do what you want them to do. You will vote for your representatives and finally be able to have a direct and decisive influence on what is decided at the European level. That’s power back to you. So other countries will be able to impose their ideas on us? This goes back to the way democracy works: we all decide together. We may disagree, but it’s still a joint decision. At heart, democracy is a way to peacefully management disagreements for public affairs. When you vote for your President or Prime Minister, sometimes your candidate wins, sometimes he loses. You don’t get your way all the time but that’s part of the game. As such, democracy is not about all agreeing on the same thing, it’s about managing disagreements. Usually, within a country, regions are not directly opposing one another: people from other regions may share your opinions, while people from your own region may disagree with you. Likewise, as a centrist Croatian, you may vote like a similar-minded Lithuanian or Portuguese, and disagree with someone from your own country. Therefore, decisions made by democratically-elected members of Parliament will not be “another country imposing its ideas” but the result of a popular decision. Interestingly enough, the current system, where decisions are taken by national governments on the European Council, directly leads to bigger and stronger countries often imposing their ideas and views on smaller ones. As such, countries such as Germany and France are more likely to have their proposals adopted than others, such as Malta or Cyprus, leading to a harmful lack of democratic legitimacy. Furthermore, practices like the one-year rotating presidency entrench a permanent instability and prevent the development of any meaningful institutional memory and long-term decision-making. The continued emphasis on austerity measures at the EU level is a classic example, where a small number of powerful decision-makers were able to impose unpopular and undemocratic decisions on weaker governments. With this system, it is no surprise that some countries feel like the deck is stacked against them and refuse to play along with community decisions. I live in a big State, what is that going to do for me? Why should I bow down to small States? Although they may have their own internal issues, larger States are the ones that have benefited the most from the current EU governance system, where their larger demography and economic size gave them a clear edge. However, just like richer regions have a strong interest in joining others in a national framework, richer countries have a strong interest in joining others in a European framework. This, obviously, was already one of the reasons for joining the EU in the first place. While all states will have equal voting rights in the Senate we envisage, more populous States will have more voting power in Parliament – as is already the case and as is consistent with democratic requirements. Overall, larger States stand to win from more integration, increased access to the common market, and less undue competition from small States – for instance States that played on lack of unanimity to maintain unfair taxation practices. I live in a small State, what is that going to do for me? Why should I get swallowed up by big States? Smaller States, or States with smaller populations or economies, currently benefit greatly from access to a huge common market, but often lose out on the governance system, where they cannot impose their ideas the way big States do. Of course, they can resort to a form of veto power but may still be constrained to accept proposals they do not approve. Therefore, while they will have fewer representatives in Parliament than more populous States, they will actually have more representatives per capita in Parliament and equal voting rights in the Senate. Furthermore, a transparent and democratic system where prerogatives are clearly defined will leave little room for the type of arm-twisting that current EU politics favour. Overall, just like national institutions already allow big and small cities, and big and small regions, to coexist in a mutually-beneficial manner within a national framework, robust and sounds federal institutions will allow big and small States to coexist and all gain from their belonging to a stronger Union. The EU is already very bureaucratic, why do you want to add another level of institutions? As you have probably realised by now, the EU we envisage will not create a new layer of institutions. By changing the current system, it will replace existing confederal institutions with federal ones. More importantly, it will replace undemocratic, unreadable and unaccountable institutions with democratic, transparent and accountable ones. As a result, not only is this not making the EU more bureaucratic than it is, but instead it is actively simplifying and clarifying EU institutions. Think about it: is it be more efficient to have a government preparing laws for Congress to adopt, or to have an unelected body develop legislation that twenty-eight independent countries must agree upon? Here is a hint: do you think your country is more efficient at decision-making with its current government or if all its departments or regions had to all agree prior to taking any kind of action? Which system is the most likely to get blocked and only agree on marginal proposals and minimum common denominators? We’re just too different, we won’t agree on anything; how can this work? People do not make countries; countries make people. What does this mean? It means that the countries we know and love were not somehow destined to be the way they are. They grew out of complicated histories and brought all sorts of people together. These people learned to live together and are now mostly happy about it. For instance, the French region of Aquitaine was part of England for centuries; Navarre used to a part of France and is now a part of Spain; Czechs and Slovaks live in different countries but used to share one; Poles and Lithuanians joined their countries before they were split us again; and Belgians are proud of their national identity, yet have only been independent from the Netherlands for less than two hundred years. History brought surprises, wars, and complications, but we learned to like the people we live with. Likewise, there is no predetermination that says we must remain separate countries: we can choose to come together and form a united, federal country. We only need to want it and make it happen. We already have a long common history, common values, mixed influences and cross-border identities. We’re not so different as nationalists and so-called patriots would have you believe. Millions of Europeans already cross borders on a daily basis for work, for travels, for life. And millions, from all corners of the Union, already support more integration. To be sure, the EU has regional differences, local cultures and preferences, but the same can already be said about our countries. People do not live in the same way in alpine Munich and low-lying Hamburg, in Mediterranean Marseille and Northern Lille, in industrial Milan and sun-baked Palermo, in Malmö and Stockholm, in Athens and on the Greek islands. We know these differences, sometimes make fun of them, sometimes celebrate them, and overall cherish them. Coming together as one federal country will not erase our differences; it will not make us less who we are. It will make us more able to control our common institutions, in full respect for our diversity. On the contrary, coming together will make us stronger and less vulnerable to those who play on our disunion for their benefit. With the rise of populist and anti-democratic regimes worldwide, we will be better placed to promote our common values and support like-minded countries. United we stand. But what if some people still oppose the idea? It doesn’t seem fair to impose it on them. This goes back to democratic principles. A sound democracy works on the will of the majority, with solid protections for the rights of the minority. For major changes, you may ask for a qualified majority, but the principle stays the same: not everyone is required to agree. This is already the case for the officials we elect, for the laws we pass, or for Eurovision songs we choose. And, indeed, with a sufficiently large group of people, not everyone will ever agree one a single proposal. It doesn’t make it unfair to adopt the proposal nonetheless; it is simply the way communities make decisions. We can, however, recognise that some countries may not want to move forward, while others do. This is the idea behind a “two-track Europe”, where the ones willing to proceed with political integration do so, while others stay behind. This is a possibility and not incompatible with a federal system. As we have said, we do not wish to impose this system, but to convince people of the need for this change and soundness of this proposal. In my country, I have rights; how can I be sure they are protected under this Constitution? Human Rights – here called “fundamental rights”, but also known as “basic freedoms” or “basic liberties” – are the necessary foundation of a solid democracy. It is not sufficient to have elections; the system itself must rest on, protect and promote human rights for all. This is why the Constitution places these rights in its very first article; because even before presenting institutions, we must establish core principles. Article 1, section 1 states that “respecting, protecting, ensuring and actively promoting them [is] the duty of all federal authorities.” It continues by listing fundamental rights, although the list is not exhaustive: the right to life and physical integrity; equality for all before the law; freedom of conscience, opinion and belief; freedom of expression; freedom of peaceful assembly; freedom of association and to form political parties and unions; right to privacy of all means of communication, and personal data and information; freedom of movement; freedom of occupation; right to education; right of equality of opportunity; right to private property and protection of said property against unreasonable searches and seizures; right of asylum; right to petition federal authorities and expect a response; and right to political representation. In some cases, and with due limitations and according to the rule of law, some liberties may be curtailed when there is a clear need for society. However, these shall be the exception and the spirit of the rights themselves shall not be tempered with. Citizens will have access to courts to defend their rights and seek redress and fair compensation. What are the responsibilities of the citizen? Democracy is a participatory system: contrary to authoritarian regimes, it provides the citizen with a way to express his opinion, needs and wishes, and develops institutions that respond to these opinion, needs and wishes. The flip side of the coin is that a functioning democracy requires the citizen to express his opinion, needs and wishes. Without the participation of all, democracy ends up responding only to the few who do express themselves, often the more radical elements, and therefore fails to be representative. An unrepresentative democracy in turn fails to serve the needs of the many and creates resentment among the population – often among the very people who failed to participate in the first place. This is not to say that a democracy where everyone participates is an ideal place, but that participation is a necessary condition (if not a sufficient one) for a functioning democracy (Article 1, section 2). Participation in democracy can take many forms, going as far as becoming an elected official. The simplest form, however, is participation in periodic elections. This is why this Constitution proposes to make elections compulsory – to highlight the fact that voting is not simply a right but also a civic duty that we need to accomplish. This is the least a citizen should do to enjoy the rights deriving from citizenship. Of course, the government has a responsibility to make voting easy and accessible, and the voting system must allow for discontent and opposition to all candidates present, but that does not change the principle that voting may be a requirement. In turn, voting requires two things from the citizen: understanding the basic functioning of the institutions, and being educated. The first item means knowing how the system works, the second means understand what the issues at hand imply. Again, the government has the duty to make education affordable, but that does not change the fact that citizens must follow a basic curriculum. Finally, more general obligations for the citizens include paying their fair share of taxes – in order to support the administration and the general welfare –, supporting one another in solidarity, and protecting the environment for our benefit and that of future generations. What are the institutions contained in the Constitution? A key principle in the devising of sound institutions is the separation of powers, with the executive, legislative and judiciary having clear and balances competences and checks and balances on each other. In the current EU set-up, the EU executive is made up of the EU Commission, heading by its President. The President is elected by the European Council (therefore, member-States) before approval by Parliament. The Commission is made up of as many members as there are States and has legal initiative on the fields of EU law. The legislature is bicameral: the first chamber, Parliament, is democratically elected but does not have the power to draft laws; the second chamber, the Council, is hardly legislative as it is made up of representatives of member-States at the Heads of State level (European Council) and the ministerial level (Council of the European Union). The judiciary is made up of the European Court of Justice which ensures uniform application of EU law. So this system has a rather undemocratically elected executive, a real legislative body with severely limited powers, a complex second chamber that short-circuit popular representation, and little judicial oversight. The strong presence of national executives in the legislative process skews the system and there are few checks and balances. The set-up of the Constitution is radically different. The first and major body is the legislature: Congress, defined in Article 2, section 1, as the representative of the people. Congress’s role is to make laws. Congress is made up of two chambers, the Parliament and the Senate, which are both elected directly by the people and both have the power of legal initiative. Members of Parliament are elected at the very local level, with member-States divided into local districts and each district electing one member of Parliament. Senators, on the other hand, are elected by the people at the State level, with two Senators per State. For instance, Austrians living in Vienna and Innsbruck, being in different districts, would vote for different members of Parliament; but, being in the same State, they vote for common Senators. The executive is presented in Article 3. It is made up of a President and of a Prime Minister with his federal cabinet. The President is elected directly by the people, so that he responds to the people and not to political parties. He stands above parties and ensure unity in the system. Management and implementation of policies is entrusted to the Prime Minister and his cabinet. The Prime Minister is elected by Parliament (therefore, the direct representatives of the people) and he names his cabinet members. Parliament can remove the Prime Minister and his cabinet from office; for added stability, a Prime Minister can only be removed if another one is agreed upon. Members of the executive may also be impeached by Congress. The judiciary is presented in Article 4. It is made up of a Supreme Court which has the power to try cases related to federal institutions and laws, and to review the compatibility of federal and State law with the federal Constitution. In this federal system, we therefore have the people’s directly-elected representatives at the heart of our institutions. They make our laws, elect the Head of Government, and have the power to remove him. The executive is strong but accountable, and the judiciary is empowered to check the two other branches. There are clear separations between the branches and proper checks and balances. How do we know who does what? Beyond the mere creation of various positions, the Constitution is clear on who does what. Each branch is described in its attributions, prerogatives and limits. Of major importance are the powers given to Congress to legislate on. There powers are listed in Article 2, section 7, and include elements above simple State interest. While the list is flexible, it nevertheless helps prevent encroachment of the federal level on the State level and therefore supports subsidiarity. Limits on the powers of Congress are detailed in section 8 (including to ensure the respect of fundamental rights or the absence of discrimination), and some limits on the power of States are included in section 9 (such as preventions from entering into treaties, creating their own currency, or raising their own army). Can a federal government be overthrown? Can officials be removed from Office? On the one hand, governments need to be accountable to their population and, therefore, to their representatives. Holding a public Office, they have a direct responsibility to the people. On the hand, stability in a political system is crucial for the smooth political process and the adoption and implementation of laws. The Prime Minister, and his cabinet with him, can be removed from Office if he loses the confidence of Parliament (Article 3, section 5). In order to limit instability, the loss of confidence is actually done through the election of a new Prime Minister. In order to ensure integrity, the President, Prime Minister, cabinet members and other officials can be removed from Office if they are found guilty of treason, corruption, embezzlement and other crimes or misdemeanours (Article 3, section 6). In extreme cases, the President can also be removed from Office if two thirds of Congress find him unable to discharge his duties; in this case, the President of the Senate replaces him. How do we ensure democracy? Democracy is an important but vague concept. Periodic, free and fair elections are the basis for democracy, but they are far from enough. Respect for the rule of law and for human rights, for instance, are necessary to ensure true democracy; the majority decides, but the rights of the minority (or of minorities) must be respected. The respect for fundamental rights is in Article 1 of the Constitution and Congress is very constrained in its ability to limit these rights. The rule of law is ensured through an empowered judiciary that has the power to check other branches and federal and State law. The Constitution also provides for some amount of immunity for representatives, but only in certain cases and it encourages Congress to lift this immunity whenever it is deemed necessary for the preservation of the public trust in federal institutions. Finally, popular federal elections are held every three years in a free and fair manner, for all EU citizens above the age of 18 and not deprived of their civil rights following due conviction. How do we ensure accountability? How do we ensure transparency? In a democracy, the best way to ensure that elected officials are accountable to the citizens is by the organisation of periodic, free and fair elections. If elections are too far apart, the threat of being voted out is smoothened. If elections are not free and not everyone can partake, a small class of politicians can share power without the fear of newcomers. If elections are not fair, there is no democracy. The Constitution therefore proposes federal elections every three years and encourages States to align their own elections on this calendar to limit the number of elections in the political life (Article 2, sections 2 and 3, and Article 3, section 1). Another important element is transparency. Even with periodic, free and fair elections, citizens cannot make an informed choice if they have no easy and transparent access to information concerning their candidates. The Constitution requires each House to keep a public journal of its proceedings, including nominative voting records (Article 2, section 5). In the interest of transparency, all federal officials are required to declare all their sources of income – past, present or promised – in order to assess their compatibility with federal Office in full transparency and therefore prevent conflicts of interest (Article 5, section 1). How do we ensure honesty? Politics is the way we manage our public life. The life of our society. There we need to have politicians and elected officials who act honestly, in the interest of all. And while politicians, as regular men, have their flaws, they are expected to carry out the duties of the Office honestly. Oftentimes, dishonesty is only attested once it’s too late – when it is actually attested. What we can do, however, is take precautionary measures. The first is to design a system that encourages transparency, including through public reporting of parliamentary activities and of official’s wealth and income. The second is to circumvent conflict of interest, by limiting the activities that elected officials can undertake while in office and requiring them to declare previous activities. This also applies to limiting the influence of money in politics, in particular in elections, by limiting the duration of electoral campaigns and putting strictly capping the maximum amount of political donations. And a third measure is by mitigating attested risk. This means that, not only will someone convicted of certain crimes including corruption, embezzlement, or wilful misappropriation of public funds lose their seat, but people duly convicted of these crimes will no longer be eligible to public office. This is in the interest of a clean political class and an important measure for the public trust. Of course, this measure goes hand-in-hand with an honest, efficient and independent judiciary, which this Constitution strives to establish. In the case of officials or candidates suspected but not convicted of these crimes, the presumption of innocent must apply. However, officials – or candidates should they be elected – suspected of crimes may be investigated and both House are further asked to consider the public trust and remove the immunity of their members if necessary. How do federal elections work? Elections are a key moment of political life, as they heavily influence the decision-making process that will follow. However, unplanned elections at random times disrupt the normal flow of the political and law-making process, giving undue importance to some issues and overly politicising events. This is why this Constitution makes a conscious effort to rationalise elections, in order to make them synchronous and along a planned calendar. It proposes three popular (or direct) elections: for the President, for Parliament, and for the Senate. The President is elected every six years (Article 3, section 1). Members of Parliament are elected every three years (Article 2, section 2). Senators are elected for six years, with half of the Senate renewed every three years (Article 2, section 3). 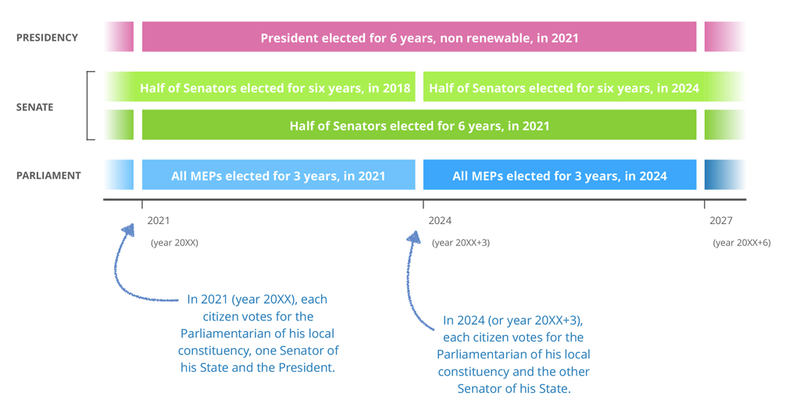 The Constitution synchronises these three elections, so that in year 20XX, citizens elect the President, all Members of Parliament, and half of the Senators, while in year 20XX+3, they elect all Members of Parliament and the other half of the Senate. Note that there are no unplanned popular elections. If the Government receives a vote of no-confidence, the choice of a new Prime Minister is limited to a vote in Parliament. If the President dies, is unable to discharge the duties of his Office or is otherwise removed, a succession mechanism, starting with the President of the Senate, is in place until the next planned election. Finally, if a Member of Parliament or Senator dies, is unable to discharge the duties of his Office or is otherwise removed, he will be replaced by an elected official from his State legislature. This way, special elections are circumscribed and popular elections remain according to the planned calendar. Who can vote in federal elections? All Union citizens above eighteen and whose civic rights have not been suspended are eligible to vote (Article 2, section 8 and Article 1, section 2). There will be no discrimination whatsoever for eligibility to vote and the judiciary will enforce this important prerequisite for democracy. What is the majority judgment proposed for elections? The way we elect our officials has a major impact on the structure of our political life. It also impacts the validity of the outcome of the vote. Grading all candidates allows a much richer understanding of voters’ appreciation of the candidates, compared to a simple yes or no, and the use of the median value provides a useful measure, in order to include what an absolute majority of the population thinks. In a traditional first-by-the-post voting system, a candidate can win with a fraction of the electorate supporting him, simply because he is indicated as first choice by a few more people. When a candidate wins with 22%, only 22% of the population place him in first position. Furthermore, even when 22% support one candidate, the remaining 78% may just as well hate him or her and prefer another candidate who was the first choice of 21% of the population. Which means that, on election night, up to 78% of the population could agree to replace the winner with someone else. By contrast, with majority judgment, the winner is the most consensual for at least 50% of the population. Majority judgment is therefore much preferable to the traditional first-by-the-post voting systems. In practice, the regular voting ballot is simply replaced by a voting card such as the following. Majority judgment was developed by Michel Balinski and Rida Laraki to address a number of shortcomings often found in traditional voting systems. For instance, when voters are forced to choose a single candidate, two candidates with similar ideas end up splitting the electorate, syphoning votes from each other and making room for a third candidate that may in reality get a lower approval from voters. Majority judgment is also less responsive to strategic voting, whereby people vote not based on their opinion but for a strategic purpose (for instance, to make a specific candidate lose). This system therefore encourages an honest assessment of candidates and opinion-based voting, and provides more satisfactory results. All for the cost of a few crosses on a single card. Finally, majority judgment, by allowing candidates who are close in political opinions to run concurrently with no risk to each other, prevents the emergence of a damaging two-party system and the subsequent polarisation of political opinions into two opposite camps. This polarisation is a major impediment to constructive political dialogue, since political ground-standing takes over real positions and solutions, and is therefore a major factor of divisiveness, contributing to more extreme positions and less tolerance of other opinions and people. In the Constitution, it is used for the three popular elections (President, Members of Parliament and Senators; Article 2, section 2 and 3, and Article 3, section 1) and for Parliament’s election of the Prime Minister (Article 3, section 3). However, in order to avoid a party gaining a large majority in Parliament simply with short local majorities, as well as to avoid strategic redistricting (or “gerrymandering”), the parliamentary election by majority judgment is supplemented with a party election aimed at ensuring that the electorate’s party preferences are found in Parliament. Majority judgment is an ideal voting method to elect single candidates, or restricted numbers. Its ability to encompass complex and varied opinions makes it a wonderful asset for democracy for the presidential and senatorial elections. However, as far as parliamentary elections are concerned, with large numbers of representatives, the importance of proportionality cannot be overstated, and majority judgment alone may not be sufficient. The central idea is to combine directly-elected representative for each district and the proportional representation of political parties. Consider the situation below, where three parties (A, B and C) run in four districts. Note that the representatives of Party A win an absolute majority in every single district (and let us assume that majority judgment would bring similar results). As far as districts are concerned, it is fair that Party A would represent every district. However, without proportionality, this would mean that Parliament would be composed entirely of members of Party A. When considering the overall party preferences of the electorate – where Party A “only” receives a 56% approval from the population – this poses a grave problem of representativeness and, therefore, of democracy. Parties B and C, while making up 44% of the overall population’s preferences would be absent from Parliament and would not provide a much-needed opposition. To bring this closer to home, we need go no further than the 2014 European Parliament elections, where the S&D group placed first in the popular vote and won 24.8% of the electorate, overtaking the PPE’s 23.8%. Yet, because of the voting system, the PPE obtained 221 seats – 30 more than the S&D’s 191. 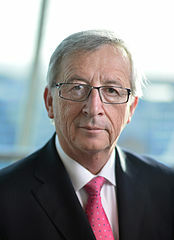 The PPE’s candidate, Jean-Claude Juncker went on to become President of the European Commission. For parliamentary elections, it is therefore essential to integrate a proportionality element. How do we do that? This limitation of majority voting systems is not new and many solutions have been put forward to solve it. The system we propose adapts the solution developed for the German lower house, the Bundestag. The idea lies in having not one, but two elections for Parliament, on the same voting card. The first vote is a direct election of local representatives. In the Bundestag model, it uses first-by-the-post; we replace it with majority judgment. The second vote is a proportional election for political parties using nation-wide lists. What does that mean for Parliament seats? It means that seats are divided in two halves. The first half has one seat for every district. In the EU, we assign a number of seats for each State, and each State is therefore divided into as many districts that each choose one representative. Each locally-elected official is assured a seat in Parliament. The second half is populated by party candidates from nation-wide lists. Seats from the second group are attributed to parties in a way that ensures that the overall electorate’s preference for parties is found in Parliament. In the above case, Party A would indeed have its four elected officials in Parliament and would receive a comfortable 56% majority; however, parties B and C would receive seats to ensure their representation as well. The following chart sums up the division of seats and presents the dual voting card. 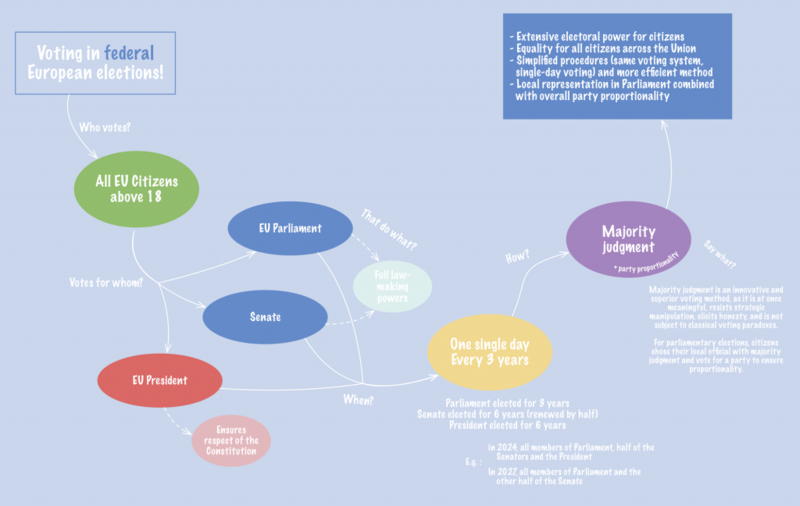 Thresholds: in order to avoid an over-abundance of parties in Parliament, thresholds can be set up, requiring parties to receive more than, for instance, 5% of the party vote, or at least 3 direct seats, in order to benefit from the party vote. Gender parity: in order to promote equal representation in Parliament, a requirement can be made that party lists alternate women and men in their positions. While this would not guarantee gender equality, it would go a very long way in supporting it. Multi-party voting: since voting for parties is proportional, we can decide to allow citizens to vote for more than one party; in this case, voting for one party would give a full vote, while voting for two parties would give each party a half vote. Citizens could split their vote as they wish. As we can see, there are many adjustments that Congress can make to build upon the constitutional provisions, and these can go a long way in strengthening our democracy. The basic idea, however, remains to ensure a double condition: 1) that each citizen directly elects its district representative, and 2) that the electorate’s party preferences be found in parliamentary representation. And, for these, this dual voting system is the best suited. If this is supposed to be a democracy, why can I not vote for my Prime Minister? Democracy does not necessarily mean electing everyone linked to State institutions. Some are not often not elected at all: civil servants in ministries, ministers, and most judges are not elected (to say nothing of royal families). Others are elected but not directly and are instead elected by people we elect. This is already the case in many countries. In France, the President is directly elected but the Prime Minister, who still holds great power (sometimes more than the President, in case of cohabitation), is not. Germany, Ireland, Italy, Romania, or Spain are among the many examples where the Prime Minister is not directly elected by citizens. In the system we propose, the President is directly elected by the people; this ensures that he stands above party politics, as he will not owe his position to his party of origin, should he have one. The Prime Minister, on the other hand, is directly elected in Parliament and elected Prime Minister by members of Parliament. This is for three reasons. First of all, so that people focus on their local representative: he is the one they vote for, he is the one who will carry their voice, and he is the one who will cast a vote for a Prime Minister. We believe this creates a closer bond and more responsibility between citizens and their locally elected official. Secondly, so that the Prime Minister himself stems from Parliament. And, thirdly, so that the choice of Prime Minister be a choice that satisfies most of the Parliamentarians who are actually elected: no one can predict who will be elected in Parliament and we should therefore wait until Parliamentarians are elected before choosing the best candidate as Prime Minister. MEPs will express their choice through Majority Judgment. Democracy is made to reflect the opinions of all citizens, manage their disagreements, and make a synthesis emerge. This requires citizens to provide their opinion to begin with. A democracy where citizens do not express their political opinion through their vote is a democracy that will not be responsive to its citizens; it is a democracy that will only respond to the opinions of the few, and often of the more radical elements. Voting is therefore as much a civic duty as it is a right (Article 1, section 2). Another civic duty is paying your taxes. People who fail to properly report their income and pay their taxes are punished with a fine – at least, when the system works. Likewise, if people fail to accomplish the civic duty of voting willingly, making it compulsory under threat of fine is one way to bolster its accomplishment. Fines are a common way to force compliance: you get fined if you go beyond the speed limit, if you don’t properly recycle, if you evade taxes, if you don’t put your kids in school. As with other requirements we decide to impose on ourselves, you can decide to make voting compulsory and to enforce this provision. Not for the sake of politicians or for nice statistics of participation, but because participation matters; because a democracy that doesn’t vote is a democracy that doesn’t live. 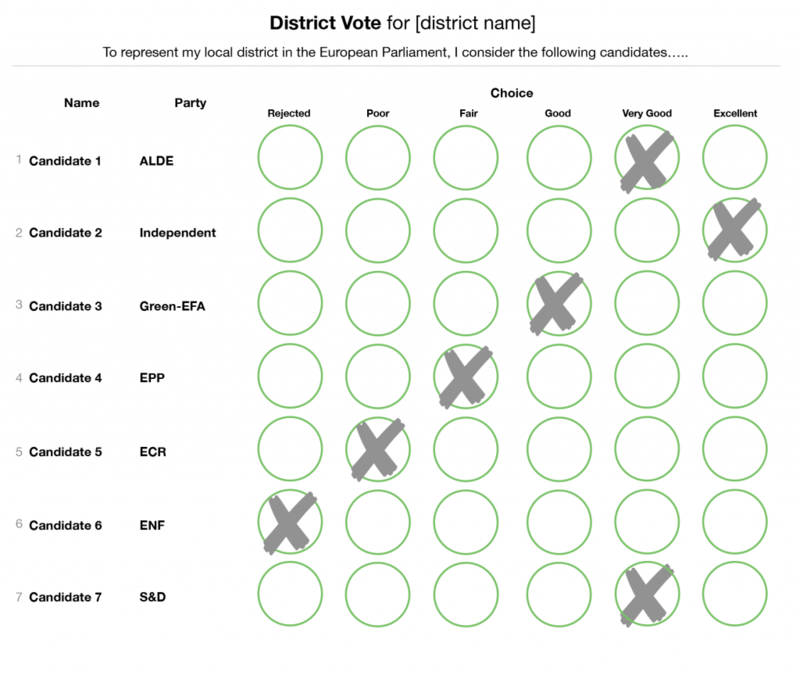 So, overall, how do elections differ from current European elections? The elections we propose are radically different from current EU elections: in terms of who can vote, who you vote for, the moment of the vote, the electoral calendar and the voting system. 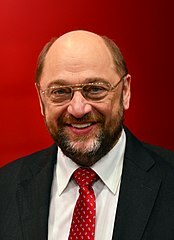 He is a summary of current EU elections. And here is a similar summary for the federal elections we propose. Who can become a federal elected official? In theory, all can become federal elected officials – and all are encouraged to contribute to political life and run for Office if they so choose (Article 5, section 1). The only limitations are: suspension of civic rights, age, and duration of citizenship. Firstly, citizens must be in possession of their civic rights, which can be suspended for a variety of reasons, for instance if they go to prison, are considered mentally unfit, or are found guilty of certain crimes, including corruption, embezzlement or wilful misappropriation of public funds. Secondly, citizens need to be above a certain age: 25 for Member of Parliament, Prime Minister and federal ministers, 30 for Senators, and 40 for President. This is a baseline condition for a minimum of experience; not necessarily experience of politics, but life experience. Conversely, citizens cannot run for Office after the age of 75. This is not so much a reflection on older people’s capacity to hold Office after that age, as much as a measure contributing to the perpetual renewal of the political class and a way to make room for fresh minds and new perspectives. Some may argue that this would deprive citizens of their right to elect this or that person; we would respond that not only do we already have such limits with a cap on mandates, but also that no one is irreplaceable and that a continent of over 500 million will easily provide a replacement for anyone, no matter how talented or beloved. Lastly, citizens are required to have been citizens of the Union for a given duration: five years for Member of Parliament, Prime Minister and federal ministers, seven for Senators, and nine years for the President. A light limitation is the requirement for Members of Parliament and Senators to be residents of the circumscription – district or State – they are elected in. Note that there is no requirement to be born a citizen of the Union, nor to hold the citizenship of a particular State. I am 80; why can I not run for elections? That's doesn't seem fair. While this might, at first glance, seem discriminatory towards older people, it is a useful limitation. First off, let us say that it is not that far-fetched: we already have minimum-age limits for elections, as well as limited numbers of mandates for each Office (except in the judiciary). It is therefore entirely possible to set maximum-age limits. Critics will say (as they do for other limitations) that these rules limit popular choice and expression. It’s true: these rules do limit popular choice. But is this a bad thing? The answers lies in whether we favour total freedom of choice, regardless of consequences, or whether we want to have safeguards that prevent potential abuses. We here take the view that a Constitution has the duty to impose safeguards. A miniumum-age limit aims at preventing the election of someone with overly limited experience. A cap on the number of mandates aims at preventing a sclerosis of the system with the same individuals in power. Likewise, a maximum-age limit aims at preventing a gerontocracy by making room for younger people on the electoral pool. This is both so that elected officials be more in sync with their population and to avoid the ever-present tendency of people in power to cling to their position for as long as they can. On both counts, we feel this small requirement is a worthy limitation that would benefit the system as a whole. Overall, we consider that no one is irreplaceable and that a Europe-wide Union would have enough qualified and worthy citizens to make up for the one reaching the age limit. How much do federal officials earn? A constitution aims at providing a framework for institutions, not at answering all questions. In this case, the proposed Constitution indicates that federal officials shall receive a “fair compensation” for their service (Article 5, section 1). The meaning of the term “fair” (which is also used in other places in the document) is willingly left undefined. This is for various reasons. First among them is the need for flexibility, as our impression of the fairness of a compensation may vary, or as the value of money may come to change over time. Therefore, the exact definition is best placed in regular federal law, and not in the Constitution. Congress will therefore be called to legislate on this issue. Another precision is that the amount officials are paid may not be diminished during their term in Office. This is to prevent undue pressure on elected officials. Conversely, any law varying the compensation for all elected officials – except members of the Supreme Court – will only enter into force after the following election. This is so that law makers cannot directly enrich themselves or other elected officials. How would we pass laws? The procedure for the adoption of laws is very simple and is described in Article 2, section 6. As representatives of the people, both Houses have a great degree of autonomy and, for instance, they decide of the laws they consider. Say the Parliament considers a bill, discusses it, amends it, and adopts it. It is then sent to the Senate for adoption. If the bill is adopted in the same language, it is sent to the President for signature. The President has ten days to sign or refuse the bill; after ten days, the bill is considered law as if it had been signed. If he refuses to sign the bill, the President sends it back to the House where the bill originated alongside his comments. If Parliament and Congress pass it again, but this time with a three-fifth majority (60%), then it becomes law. The Constitution only says that a bill should be adopted in the same language by both Houses. This could imply an endless back-and-forth between the two houses. In order to avoid this, Congress is strongly encouraged to set up a resolution mechanism with representatives of both Houses in order to smooth out differences. This mechanism is not included in the Constitution in order to provide more leeway to Congress and have it take ownership of the legal process. A constitution is simply not the place for such level of details. The Constitution, however, adds two important precisions. Firstly, that voting shall be carried out so that voters are not aware of each other’s vote, but made public afterwards. This is very simple but important: the first part aims at removing undue influence and have Members of Congress vote based on their opinion and judgement, not based on what others have voted; the second part aims at transparency, so that citizens may know what they representative voted on each issue. Secondly, the Constitution adds that no text shall be voted on less than seventy-two hours following its full and final publication and availability to the voting House and to the public, whichever takes place last. This is to avoid cases of backroom deals and last-minute additions and arrangements, with Members of Congress voting at three o’clock in the morning after extensive modifications. These practices are clearly detrimental to transparency and democracy and cannot be tolerated. On the opposite, time must be given both to Members of Congress and to the citizens at large to know what is being voted on. One could argue that, for major laws, seventy-two hours is not sufficient. There is a need to balance openness and efficiency. Seventy-two hours feels like a sufficient amount of time to consider bills, without making the adoption of laws overly long and allowing quick reactions whenever necessary. This remains an essential mechanism for transparency. What are the powers at the federal and State levels? The Constitution, being a federal document, focuses on federal-level prerogatives. Therefore, despite a short list of elements that are explicitly forbidden for States to legislate on (creation of their own currency, raising of a military, etc.) in Article 2, section 9, the Constitution focuses on federal prerogatives and limits, in Article 2, sections 7 and 8. As for the specific division of areas, the foundation of this system is subsidiarity – meaning that each topic must be legislated upon at the level that it concerns. While this is sometimes subject to personal opinion, it means that, first and foremost, Congress will legislate on the regulation of internal trade and on trade relations with other countries, military issues, justice, currency and monetary issues, budget, and Union-wide issues of infrastructure, consumer protection, environmental protection, and public health, among others. The list for the federal level may seem long, but only because it is not directly compared with that of the State level, which would in all likelihood be longer. What does it say about accession to and secession within or from the Union? As we have seen with Catalonia, the topic of secession can be a highly emotional one. References to the idea of “the nation” and to identities start being thrown around and things get tense. The central idea behind this Constitution’s approach is to put principles first. We adopt principles because we believe them right, and we follow them because this is what coherence commands. Since they relate to our values, they rank higher than administrative issues. The principle at hand is that of the people’s right to self-determination. Although enshrined in international documents adopted by States, this right was, for obviously reasons, always a touchy issue. One easier applies to others than to oneself. It provided the backbone for calls for independence and decolonisation. But when it came to some regions wanting to secede, States were always more careful and often less open. The idea behind this principle is that a nation is a willingness to live together; a continually-renewed engagement to share a common system and to create a common future. It is a social union of a group of people. Just like in other social unions, such as marriage or civil unions, it can also come to an end. People may not be happy about divorce but it remains an essential right and one that must be upheld. Likewise, should part of a country decide to separate from the rest of the group, it must be allowed to. That does not mean we agree, that means we respect their decision and their right. The Constitution therefore places the respect of this right above the perpetuity of borders. Although dipped in history, national or regional borders are administrative issues and should not prevail over the rights of the citizens. Furthermore, instead of leaving a situation fester, it is more mature to address and provide a legal framework for it, including fair mechanisms and limitations. Secession is therefore recognised (Article 5, section 4). In order to create a new territory by secession from a State or junction of two States or parts thereof, a free and fair popular referendum must be organised in the regions concerned and a qualified majority of three-fifth must be in favour of the change. In the case of Catalonia, this would just be the population of Catalonia, not the entire Spanish population. Then an agreement must be made without delay between the leaders of the new-territory-to-be and the State or States concerned. This agreement must be approved by Congress and enter into force, at which point the new territory is created. Congress may intervene is necessary. The new territory is not automatically a new State of the Union. Congress must approve its entrance into the Union with a three-fifths majority. If this is denied, an agreement must be made without delay between the leaders of the new territory and Congress to delineate the modalities of secession from the Union. Finally, States may altogether secede from the Union following a free and fair referendum with a two-thirds majority. The points of view here is, as underlined by the qualified majorities, is that secession should not be taken lightly and that it should not be encouraged. However, it must be respected if it truly reflects the people’s wishes. The point of the Constitution is to come together as Europeans, but not to force unity down people’s throat. We should make citizens fall in love with the Union and have them want to be a part of the Union. If anything, this Constitution is also an attempt to prevent people from falling out of love with the Union because of its current institutions. But this will not be achieved with institutional shackles. People cherish their freedom and their freedom must be respected; it is our duty to make them wish to stay in Unity. Where are the other institutions? Where is the Central Bank? This Constitution is, on purpose, concise and limited to the minimum. This is to ensure its resilience, its duration, and its flexibility. The only institutions described in detail are the three main branches of government. This of course does not mean that these three are the only federal institutions needed. Indeed, the Constitution leaves room to create other institutions and some of them are hinted at or even mentioned in the Constitution. For instance, monetary policy is one of the competencies of Congress. It should be so because money belongs to and should serve the people. However, in terms of institution, it is fitting that monetary policy be entrusted to an independent body. Article 2, section 7 therefore both gives monetary policy as a competency of Congress and at the same time requests the establishment of an independent Central Bank with a clear mandate. In giving Congress the power to “protect, ensure and actively promote consumer protection”, the Constitution recommends – but does not request, this time – the creation of a federal agency dedicated to implementing this prerogative. Congress is therefore strongly encouraged to set up a consumer protection bureau that support the general interest of consumers in the face of more powerful entities that would seek to subvert it. A number of other bodies or agencies are likewise recommended to Congress, such as an agency for tax management, relevant bodies for the protection and promotion of public health and of the environment, law enforcement agencies, etc. These bodies and agencies – irrespective of their exact prerogatives – will be created and provided more flexibility by not being entirely detailed in the Constitution. There lies one of the keys to their success. How can we change the Constitution? Even though the Constitution is made to be minimal so that it may endure, it may become necessary to amend the Constitution. Just like secession, this must not be easy but be possible. Amendments to the Constitution are therefore possible (Article 6, section 1). Like bills, amendments must be adopted by both Houses but require two-thirds majorities in each House. They enter into force once they have been ratified by two thirds of the Member-States, according to their ratification procedures. Logically, amendments may give new powers to Congress; however, they cannot deprive citizens of their rights or attain to the equality of States. Finally, no amendment can be adopted in the first thirty-six months following the entry into force of this Constitution. This is not meant to limit popular sovereignty but to allow the new institutions to develop and people to settle in their new system. This way, we aim at avoiding rash decisions drastically affecting the Constitution simply due to the novelty of the institutions at hand. The point of this publication is to make the Constitution available to all, so that it may mentioned, discussed, criticised, amended and, hopefully, adopted. Not against the wishes of the people, but with their approval. Likewise, the Constitution is planned to enter into force once three-fifths of the Member-States have ratified it (Article 6, section 3). Of course, this entry into force will only concern those States that have ratified it. What happens when some States have ratified it and other not is complex. It would be easier for all to adopt it together, but it cannot be forced. If only some States ratify, but enough for entry into force, things will have to be worked out as they come. Institutions will have to coexist for a time, even though former institutions will quickly start to lose their substance and their momentum as they are drained from the former involvement of all those who have ratified the new Constitution. Overall, this should not be a great concern. It might make things messy, it might complicate the transition but, on the grand scheme of things, for a Constitution that will set the stage for a new country for centuries to come, a transition period is a small and welcome price to pay. Why is the document so short? Why is there nothing on State institutions? The Constitution is indeed short; in its present form and with regular-sized fonts, it fits on twelve A4 pages. This is for various reasons. First of all, the Constitution is made short so that is remains clear. While length and clarity do not always go hand-in-hand, we believe a short document is more likely to stick to the fact than one unconcerned with its own length. Secondly, it is kept short so that it be readable. Among the responsibilities of the citizens are that of knowing one’s institutions. In all honesty, it cannot be required for all to be acquainted with federal institutions if their basic description takes 20, 30, 50 or 100 pages. In this sense, the former Treaty establishing a Constitution for Europe proposed in 2004, not only failed to go far enough, but was itself overly long, overly complex and profoundly obscure for the non-technical citizen. This is not what should be expected from the basic law of our political system. Lastly, it is kept short because it does not aim at providing all the answers. A constitution aims at setting up fundamental institutions, structures, principles. It should stick to the minimum and let the rest be decided by law, and evolve as society does. Many questions that could have been clearly answered in the Constitution were left out, on purpose, in order for the answers to be decided and provided by Congress instead. If we want this document to endure, it must not pretend to have all the answers, and especially not answers that will forever be suitable. All previous constitutions have come to include elements that became out of touch with an evolving society. This is entirely normal. For this reason, the content of the Constitution should remain limited in scope and future generations must be trusted to find better and more fitted answers than we can hope to establish today. If your reforms are so smart, why is no one talking about them? And how come no one has done them before? Actually, if you seek them out a bit, you can easily find a lot of people discussing the necessity of a federal Europe. Concrete proposals to this effect date back at least to the 18th century and have been made periodically ever since. Obviously, these proposals have been more regular since the end of the Second World War, and later with the creation of the first European institutions. The founding fathers of Europe themselves were in favour of a federal union and pushed in that direction: Jean Monnet, Robert Schuman, Paul-Henri Spaak, Altiero Spinelli. It is only the reticence of national leaders that prevented this project from being adopted. However, it’s true that, in recent years, federalism has not been making the headlines too much. This is linked to various factors. First of all, there seems to have been a shortage of major pro-federation public figures; Jacques Delors – former President of the European Commission – being probably the last of them. National leaders have instead used the EU for their personal gain: trying to obtain funds from the institutions or share burdens with other countries through them, blaming the EU when their national situation falters, but taking the credit for the Union’s efforts when they come to fruition. This continued attitude has greatly damaged the EU, seen as a technocratic puppet barely good enough to try and apply the policies of the member States and seemingly always falling short of expectations. Secondly, public opinions themselves have not been very EU-friendly. Following critics from their political class, EU citizens have been quick to blame the EU for economic downturns, over-regulations, lack of democracy, etc. While this criticism was not always baseless, it was also much too systematic and simplistic. For instance, it clearly did not account for the fact that, more often than not, when “the EU” fails to acts, it’s because the member States themselves (and not supranational institutions) do not reach an agreement. This would be like blaming a President when Parliament has disagreements. And, thirdly, even when people support the EU, it’s true that federalism has for many been seen as a step into the unknown, as something that the public at large would not accept. Officials have stopped considering it a viable policy, and politicians and public thinkers have stopped mentioning the prospect altogether. However, federalism is not only possible but necessary. Getting people ready to want drastic reforms may be complex and require time, but people are able to get an informed opinion and make sound choices. Opinion polls actually regularly show that populations are much more pro-European than national and party leaders. What we need to do is start reintroducing the idea into the public debate, and make people see it as a viable and desirable solution. Only then will we be able to convince sufficient people for the idea to snowball and become a reality. And this is what this proposed constitution is about: beyond the exact content and wording of this document, it aims at showing that a European constitution is possible and that it can be accessible and understandable to everyone. Let us bear in mind that confederations have never worked on the long-term and that if we fail to bring the necessary democracy to our institutions and make them work for all, and not just the privileged few and the most powerful States, EU citizens will keep falling out of love with the Union and nothing will hold them back as they one after the other decide to leave. Many groups support European federalism: among them, Volt, the Union of European Federalists, and many members of ALDE and other prominent Parliamentarians belonging to the Spinelli group. Seek them out, ask them what they stand for, tell them what you stand for and what you want. Tell them about this constitution. We are many to believe in this project: let’s discuss it, show its strength and the hope it embodies, and finally make it a reality. Who is expected to support this Constitution or oppose it? Support for more European integration or European federalism is to be found in many places. Numerous political parties, think tanks, public thinkers support moves for a more democratic and robust EU through an institutional overhaul that would lead to actual decision-making and enforcement powers at the European level. Among them are Volt, the European Democratic Party, the Alliance of Liberals and Democrats for Europe Party (ALDE) and its 60 national parties, the European Federalist Party and related Stand Up for Europe movement, the Institut Notre Europe, the Spinelli Group, the Union of European Federalists, the European Movement, and many more. They may not have the same idea for institutions but could support a version of a European Constitution. We encourage you to question them on their preferences for EU institutions and their willingness to adopt a Constitution and, should you be convinced, join them and contribute to their advocacy efforts. Democracy is as much about institutions as it about popular engagement and convictions. Opposition is to be expected from two main sources: let’s call them ideological opposition and interested opposition. Overall, ideological opposition is based on convictions that stronger European institutions would be damaging to national sovereignty, individual freedoms or just to the way things ought to be. While we strongly oppose that a federal EU runs against individual freedoms (article 1, section 1 precisely aims at placing fundamental rights above all else), we very much agree that a federal EU would mean less national sovereignty. Limiting national sovereignty is a precondition for a more democratic Union and we see it as a very positive and long-awaited development; not for the sake of limiting State power, but in order to empower common institutions that properly and efficiently work for all of us. Those supporting these positions, often linked to nationalist and right-wing parties, are entitled to their opinion but we oppose them on ideological bases: we often share similar concerns as to the problems we face, but we identify radically opposed solutions. We favour coming together and building together, instead of shrivelling back to narrow borders and interests. The second source of opposition we expect is of a very different nature: it is very often less the result of a convinced opinion than based on practical interests and considerations of power. In the same way that national governments are very reluctant to cede power to local institutions through decentralisation, for fear of losing their prerogatives, they often oppose the transfer of core competencies and sources of sovereignty to European institutions. Not because they believe this would have negative consequences but in order to cling to their position of power. A federal EU would indeed see Heads of State or Government lose some of their power and independence in favour or EU elected officials. This is already why national governments, through the European Council, have resisted the politicisation of the European Commission and refused to let the European Parliament (the only EU directly-elected body) initiate laws. We therefore expect States to support the maintenance of State prerogatives. Bigger and more economically powerful States, in particular, are expect to cling to the current system that gives the lion’s share of the decision-making power. Likewise, major political parties who have historically held vast influence and power at the national level are expected to opposed stronger federal institutions, as these would lead to a great reshuffling of political parties. National party leaders would lose power and independence relative to EU-level party leaders. Private interest groups benefiting from the current division of EU member-States will also take position against federal institutions. For instances, large companies that exploit national loopholes and the differences in legal frameworks to avoid paying their fair share of taxes will lose these undue advantages in a more democratic EU. They will not give up these advantages gladly. Likewise, wealthy individuals crossing border to benefit from lax taxations schemes or companies benefiting from large State subsidies or even government corruption will likely oppose a decrease in State power and national regulations to the benefit of a level-playing field that works for all. We are therefore aware of opposition to this European Constitution, both based on principles and based on interest. We seek to convince the former and expose the recklessness and double standards of the latter. This opposition, strong, entrenched and durable as it may be, will not deter us from pushing forward with the proposal of a European Constitution. Because this proposal serves the interest of all citizens, and because nothing less than our future and our independence is at stake.